As a pleased owner of a Google Home Mini, I often find myself wondering why I didn't buy one or two more of these tiny smart speakers to scatter around our apartment unit. When I ask my wife what she thinks of getting some companions for our lone Mini, she aggressively asks "Why?" — and, well, that's the end of that. 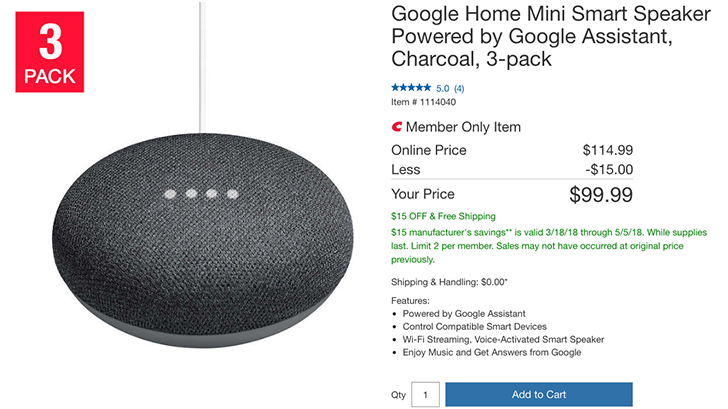 But now Costco is giving me some new ammunition, thanks to a deal offering members the chance to purchase a Google Home Mini (charcoal or chalk) three-pack for just $99.99, which is $15 off of the normal going price. This member-only price works out to $33.33 per Google Home Mini. To be clear, this isn't the best price we've ever seen. These smart speakers went for as little as $4 and $19 during Black Friday season, depending on how flexible you're willing to get with the math. But this is better than more recent deals for the tiniest member of the Google Home family, and it beats the pants off of the $49 price on the Google Store. The deal is good through Saturday, May 5th, while supplies last. There's also a limit of two per Costco member, which means you could get six Google Home Minis for $199.98. And it's worth noting that this offer applies only to the charcoal and chalk variants of the Mini. Shipping is free, and the expected delivery time is 5-7 business days. If you've thought about populating your abode with a few Google Home Minis, this is a deal worth considering. And if you're wondering what exactly you can do with these things beyond setting alarms, asking about the weather, and controlling smart lights, Rita's comprehensive Google Home guide is a must-read.